The Options Menu of Dragon Mania Legends is where various information and game settings can be found. The menu is accessed by selecting the option in the top-right corner of the main screen. Selecting this option will bring up a various list of other games developed by Gameloft which can be downloaded and installed. This option will take the Trainer to Gameloft's Customer Care page while also automatically conveying Trainer information such as age, gender, client ID, language, country, platform, game version and firmware among many others. In this sub-menu, the Trainer can see all the past and current news announcements related to the game. Each news release will have a timestamp (excluding the year), a representative image and one or more tags (such as News, New Content, Event, Tips, Community, Contests, Preview, Sale, and Video). 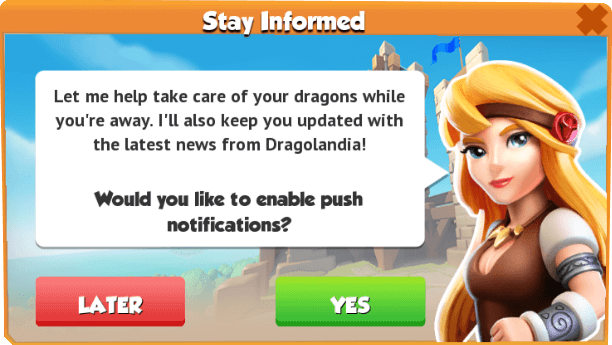 As suggested, the news is usually about upcoming Game Updates, sweepstakes, large events, Dragon of the Week, Dragon of the Month as well as other topics. Whenever unread news is available, a red-colored circle indicating the number of new articles will be shown in the top-right corner of the access button. Additionally, in the bottom-right of the screen, the Trainer can access a collection of various videos. Here, the Trainer can access five different links related to the game using the button next to each option. 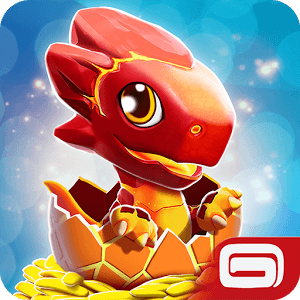 - Trainers will be taken to the main interface of the Dragon Mania Legends Forums. From there, the Trainer can choose a sub-forum that fits the topic they wish to discuss or research. News And Announcements - Formerly used as the means through which forum moderators and administrators made various announcements (the last thread to be created was in 2015 and all eight existing threads are comment-locked). Discussions - The largest and most active sub-forum with over 4,700 topics and over 240 pages of threads. Add Me - A sub-forum for posting friend requests. Technical Issues - Used for reporting bugs, errors or any other related issues. Clans - Used for advertising or finding Clans or Clan members. Suggestions - The sub-forum for posting new ideas or features. - Trainers will be taken to the official Facebook page of the game. - Trainers will be taken to the official Instagram page of the game. - Trainers will be taken to the official YouTube channel of the game. - Trainers will be taken to the Main Page of the Dragon Mania Legends Wiki. Trainers are able to choose between fifteen languages for their game: American English, Standard German, Italian, Peninsular Spanish, Japanese, Korean, Standard Chinese, Brazilian Portuguese, Russian, Turkish, Modern Standard Arabic, Thai, Indonesian, and Traditional Chinese. The language will affect the Global Chat, as each language has its own separate chat. This sub-menu allows the Trainer to control the settings of the game. For new Trainers, a screen with Arya will pop up asking the Trainer whether to enable their notifications or not. Regardless of the answer chosen, notifications remain active by default and must be manually disabled. The game might occasionally send a different type of notification that can not be found under this menu, such as new bundles or events. Disabling these notifications can only be done from the app settings of the device the game is being played on. In this sub-menu, the Trainer has the option to control the sound and music volume as well as being able to enable or disable either one through the button. The volume of advertisement videos is not affected by the in-game sound settings, even if the audio is completely disabled. The audio sound of advertisements can only be disabled from within the settings of the device the game is being played on. The scrolling speed of the game can be fine-tuned from this menu. The difference is most significant when navigating through large areas of the game, such as the islands or the Campaign Map. Trainers can choose a nickname for themselves and have it displayed to other Trainers. Setting the nickname for the very first time is free while any subsequent change will cost 5 Gems each. Confirming the nickname is then done through either the button or the button, respectively. The Trainer can also have the game suggest a random name through the button. The nickname is limited to 24 characters and can not be colored. Spaces are cropped before or after the nickname. Android and Windows Trainers have the possibility of lowering or increasing the quality of their game's graphics in order to increase performance. This option is not available to the iOS platform. Android Trainers can do it through the button while Windows Trainers can do it through the button. From here, Trainers can choose between low, medium and high. Once the desired value is chosen and the button is selected, the game will then prompt the Trainer to restart their game in order for the new settings to take effect. The game will preview the changes live, through a sample image, as the graphics are adjusted by the Trainer. Through this button, the Trainer can connect to various social platforms in order to store their game progress or even earn rewards. There is always at least one connection option (for some platforms, a second option might also be available). If an account already exists on a device and the Trainer wishes to connect to another account, a conflict screen will appear after connecting to the second account. The screen will prompt the Trainer to either keep the current account or switch to the other one. The option to log into Facebook is available to all platforms and Trainers. Pressing this button will bring up a prompt screen requesting the Trainer to log into their Facebook account in order to connect it to their game. Connecting the game to Facebook for the very first time will reward the Trainer 10 Gems and the Prairie Dragon. Android users (except for FireOS users who have no secondary network option) can connect their game to their Gamer ID through the button. Windows users can connect their game to their Xbox Live account through the button. A secondary network for iOS users was available prior to the release of iOS 10, namely Game Center. This app was discontinued after the release of iOS 10, but the game can still be connected to it (albeit outside the game) through the device's own settings, and saved files can be retrieved from it. This is reflected inside the game where the Trainer's Game Center username is also displayed right under the option to connect the game to Facebook. This sub-menu allows Trainers to choose one out of three different options for the privacy of their profile in regards to other Trainers visiting their island. Default: Any visitor can see the Trainer's Dragons' levels and can check their Player Profile. The "last online" status can only be seen by friends and Clanmates. Hidden: Only friends and Clanmates can see the Trainer's Dragons' levels and can check their Player Profile and their "last online" status. Private: No visitor, whatsoever, can see the Trainer's Dragons' levels or can check their Player Profile or "last online" status. Additionally, the Trainer will also not be able to receive friend requests or Clan invitations nor receive log updates about visitors. The Trainer will be able to send friend requests and Clan invitations to other Trainers. This sub-menu deals with general information about the game, as well as with Gameloft's policies. Vital game information, such as the current version, the Gameloft Trainer ID and the Trainer's server. Additional information is also presented, such as the credits (the team behind the game), software license, disclaimers, copyrights and other information. Unlike other menus, this one is automatically scrolling. This sub-menu provides information that includes general gameplay and new updates, among others. FireOS users can access this exact same menu through the button. This button will display several informative panels related to the current update. Most of these will have a button that can be used to access that new feature directly. This button will open the first page of the in-game help, where information about feeding and leveling Dragons is found. This button will open the ninth page of the in-game help, where information about the islands can be found. This button will open the seventh page of the in-game help, where general information about battles is presented. Mouse Click (any) - A prolonged click and then a release allows the Trainer to pick up their Habitats and move them around without having to hold the button down. Clicking again in the decided viable spot allows the Habitat to be relocated to that space. This option provides information about microtransactions, refunds and Gameloft's registered office, among others. This option is used to port the Trainer's game progress onto a device having the same platform and server as the origin device. After the button is selected, a 10-minute code will be generated that can be entered on the desired device by accessing the same screen and selecting the button and then adding the generated code. This option is not available to iOS & Windows Trainers. This option can be used to make a video recording of the gameplay. When the button is pressed, the button in the upper-right corner of the screen will appear and the Trainer must then press it in order to give recording permission to the game. The first button will then change to the button while the second one will change to the button and pressing either will stop the recording. Recording can also be done through the button, wherever this is available. This option is not available to the Windows platform, as the Windows OS has its own software for recording game clips. In some cases, due to faulty internet connection, caching problems or an incomplete update, the game might be missing partial content. The amount of megabytes shown on the left indicates the size of the downloadable content the game can currently retrieve, while the amount on the right indicates the total size of content the game should normally have. The button is used to download the missing parts. Downloading the content can be cancelled through the button. When the entire content is present in the game, the button will be grayed out. Below the button, all of the update packs are displayed in the form of a list. Update 4.5 introduced privacy settings. Update 4.3 added the option to cancel an ongoing downloading of the downloadable game content. Update 4.1 discontinued the button because support for connecting the game to MSN accounts was dropped. The Link a Device option was discontinued for the Windows platform. 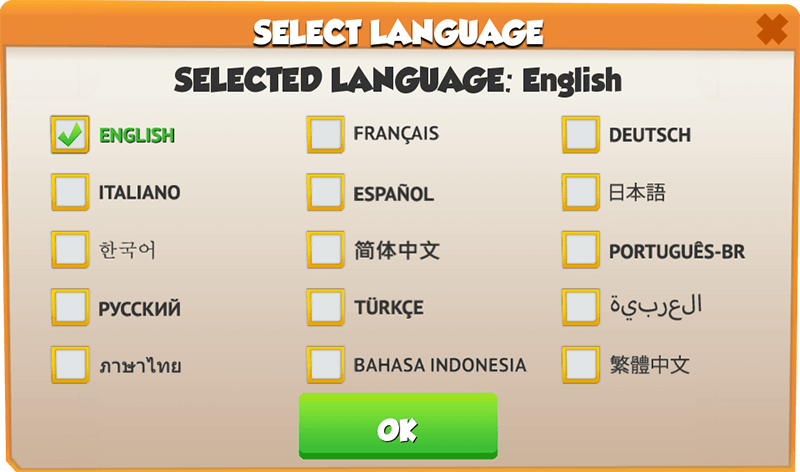 The interface for selecting a language was changed: the flags have been replaced by the name of the languages, with each language having its own checkbox. Additionally, the flag of the current language is no longer shown on the button. Update 3.7 introduced the option. The button was replaced by the button. Now Trainers have the option of accessing other sites, through the game, instead of just the forums. The flag of the current language of the game is now directly shown on the button. Changing the game graphics through the Graphics sub-menu is now done by dragging a bar instead of ticking boxes. Additionally, in the same sub-menu, the Trainer can now preview the impact the level of the graphics will have on the game when dragging the bar. A notification for the Whale-Mart has been added under the Notifications sub-menu. Update 3.6 discontinued the Gameloft Connect Menu completely from all platforms, alongside the button, whereas the , and buttons were moved under the Options Menu, the last button having replaced the button. The button was replaced by the button for Windows Mobile. Update 3.5 introduced the and buttons for Android and Windows, respectively. Update 3.4 introduced the button at the top of the Options Menu. Under the Gameloft Connect Menu , the button was replaced by the button. For the Android platform, the button was replaced by the button and the entire Gameloft Connect Menu was moved and turned into a sub-menu under the Options Menu right below the option. Update 3.0 introduced the option to enable or disable all notifications at once. The two separate notifications for Battle Energy on the Campaign Map and in the Dragon League have been merged into a single one. All notifications related to Enchantment have been merged together. All notifications related to Clans were combined into only one. The notification for ruins and the one for Chronos have been merged together. Update 2.8 added notifications for potions, Gift Chest and Weekly Dragon Pieces. The button replaced the button while the button replaced the button. Update 2.6 added notifications for Clan Events and for Clan Dragons. Update 2.1 added notifications for Chronos, Arena Energy and the VIP Status. Update 2.0 discontinued the Link a Device option for iOS. Update 1.9 introduced the option to record the screen (along with the buttons pertaining to this option) and the option.